Clergy have a pivotal role in creating and nurturing church communities in which all people can grow up into Christ. This book explores the nature of that role by considering key similarities with the essential but often conflicting demands of motherhood. Like mothers, clergy need to preserve and hold people faithfully, while encouraging them to grow, take initiatives and become more confident and self-supporting. This book will help clergy to think about how this is achieved through the myriad of 'small' things they do from day to day, highlighting skills such as comforting, cherishing and multi-attending - skills that are centrally important but often unarticulated and undervalued. What Clergy Do by Emma Percy was published by SPCK in April 2014 and is our 21475th best seller. 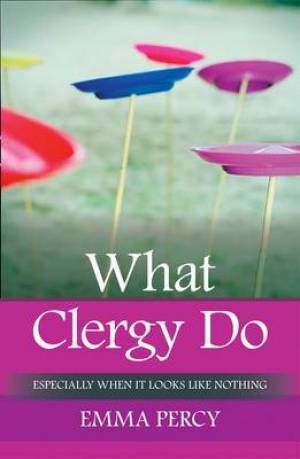 The ISBN for What Clergy Do is 9780281070244. The old adage of 'six days invisible.....' when referring to clergy used to be regularly spoken of. Thankfully those days are long gone. Here in this rich and loaded text from Emma Percy is one of the most helpful theological works on the pattern of parish life taking the maternal metaphor as the dominant lens. This a beautiful and chewy work that deserves not to be read quickly. I loved the 'food is in the fridge' metaphor as it was well explored by Percy. There is challenge, realism and failure visited thoroughly in this rigorous work. Few pastoral ministry titles grapple with 'constant interruptablity' and the palpable realities of never being finished, for there is always more to do. Percy engages with the focus on church growth as the primary marker of success and the need to ‘keep the show on the road,’ nurturing a congregation in its faith and growing in community. Never defaulting to advocate church in club mentality, but recognising that much of the daily work is not measurable as an easy output or performance indicator. Percy's prevailing idea is the need for a change of language, quantifying comfort, engaging pastoral faithfulness and making peace with the reality of failure too. Value is explored well. This is rich in analysis, complexity and care. This is a weighty brilliant vocational work of discovery. I trust the gender lens will not spoil the receptivity of this vital and important text. This is an anglican must-read, for ordinands, clergy and churchwardens. Rarely is the pivotal role of clergy and the nurture they can offer in Christ so well explored. Because "we are owned by eternity" we are invited to serve realistically well in the light of this. This is top-class stuff. Thank-you Emma Percy. Got a question? No problem! Just click here to ask us about What Clergy Do.